Intertops Poker is celebrating its move to the hottest poker network in the world with free rolls and special tournaments all through May. Intertops Poker, part of the world’s first online sports book and casino since 2003, switched this week from Microgaming to the Cake Poker Network. The move follows Intertops Casino’s change from Microgaming to RTG games last fall. To commemorate the move, Daily $100 Free Rolls will continue through May and every Sunday there’ll be $1000 Guaranteed Freeze Out where players can buy in for $20+2 or win their seat in twice-daily free roll satellite tournaments. For the biggest celebration this week, Intertops Poker will give away $2500 in Saturday’s $2500 Free Roll Celebration. Details about these tournaments as well as the Daily Door Crasher added value tournaments, the $150K Points Race and WSOP Satellite tournaments are available on the Promotions tab at http://poker.intertops.com. Intertops will honor all existing Gold Chips, Gold Cards and Gold Stacks loyalty rewards held by players of rooms that have recently left the Cake Network, such as Sportsbook.com, PlayersOnly.com and PokerHost.com. 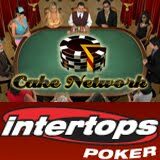 Several major poker sites have joined the Cake Network recently and now, as Intertops players join them, it is one of the most popular poker networks in the world. Created by a small group of poker players with a mission to design a better poker site, its gold loyalty rewards programs and its well-sculpted 3D human avatars and other aesthetic features have helped it become one of the fastest-growing poker communities online. Intertops was one of the world’s first online casinos and its sportsbook took the very first online wager more than fourteen years ago. US-friendly. Intertops Casino features more than 300 instant-play and download games including 3 and 5 reel slots, multi-hand video poker, and traditional casino games. Intertops is known as one of the most reliable and trustworthy online gambling sites in the world and they continue to earn their reputation for quick, hassle-free deposits and withdrawals and excellence in customer service. Players can use their one Intertops account in the casino and poker room and to place sports bets.